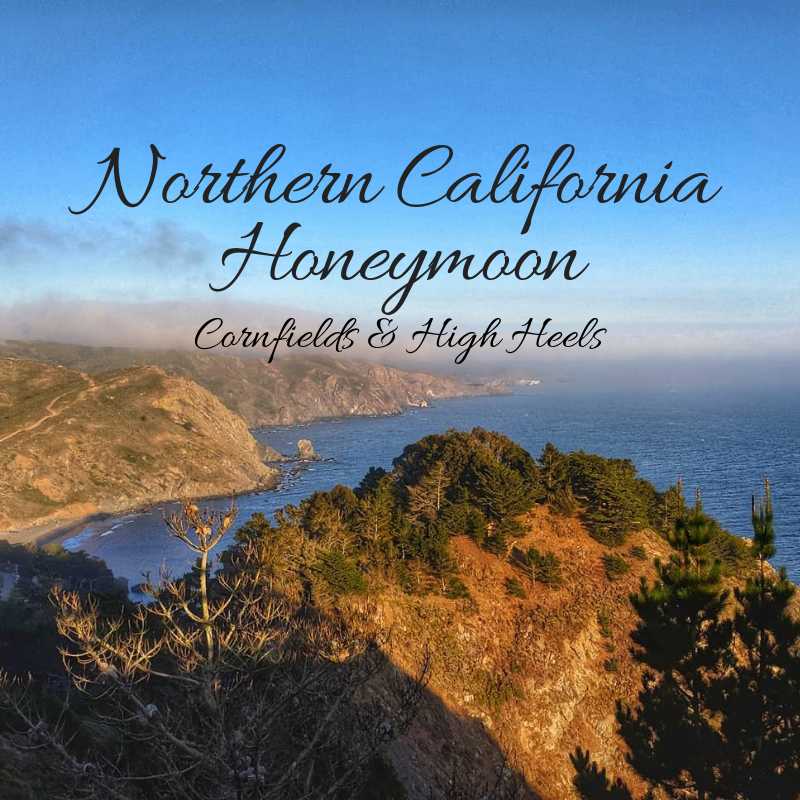 Gosh, it’s already been 6 months since our honeymoon and I’m just now getting a blog up about California! That’s the mom life for ya! We were fortunate enough to have had a honeymoon given that we have four kiddos combined but planning this was one of our priorities. Following our intimate and sweet wedding ceremony on Lake Wawasee, we immediately made the drive to Chicago to take a red-eye to San Francisco. I wish I could tell you that it was an easy-breezy flight and landing, but between delays and car rental nightmares, we didn’t make it to our destination until around 6 am CST (or 10 am our time) the next morning. Besides that part, we had an amazing honeymoon! I still think about it often and can’t wait until the next opportunity arrives that we can travel back. We honeymooned the end of July through the beginning of August and stayed in Sacramento (which is very hot this time of year). Our explorations included San Francisco, the Pacific Coast Highway, Napa Valley, Sacramento, and Eldorado National Forest. We wanted to include Lake Tahoe and the Redwoods into this but with the fires in Northern California, at the time, we weren’t able to travel to these locations. Being in Sacramento reminded me of being back in Texas. Warm, dry, dusty, sunny, and bright. It was in the 100s when we visited, but minus all the humidity I’m used to at home. We spent an entire day exploring the city, including Old Sacramento (“Old Sac”)in the riverfront historic district. Old Sac contains of over 100 businesses, museums, and attractions that you can explore on foot (parking garage available for a fee or free parking on side streets). Adjacent to Old Sac is the Tower Bridge (aka Yellow Bridge) along the Sacramento River. Being a major landmark for the city, I suggest visiting this bridge if you are already in Old Sac. You can walk on and under it, the bridge offers a great background for photos (especially at night)! Now, let’s talk about food! I feel that some of the main highlights of Sacramento were the many food and coffee options that are available! The Waffle Experience was awesome for brunch! They have some of the most unique waffle dishes, the best potatoes, and delicious craft soda. For coffee, I suggest Station 38 for their Iced Sea Salt Carmel and Iced Vietnamese or Temple Coffee for a handcrafted latte! Shift Coffee also has a really awesome set-up, just visiting for the atmosphere is worth it but having one of their breakfast sandwiches will be life-changing! They make a pretty mean latte as well. While traveling back to Sacramento from Sly Park we stopped for a treat at Sweet Dozen Cones. Specializing in ice cream and donuts, their cone shop in Folsom, CA has donuts shaped into cones and filled with ice cream. They have many options to choose from and are HUGE, definitely shareable! Most people think of Napa Valley when considering northern California as a destination, it’s such a popular spot and knowing we’d be there during prime honeymoon season we planned ahead. Although Napa is known for endless vineyards and wineries, it is so much more than that! The scenery, small towns throughout the valley, and sunsets over the mountains and vineyards are beautiful! We had several recommendations for the Napa Valley Wine Train. We made reservations several months in advance (plan ahead!) and choose the sunset dinner train. Additionally, I choose one specific winery I wanted to see in Napa. We were visiting more for the experience than for wine consuming and I knew that Castello di Amorosa would offer a great opportunity for that. If you are from the Midwest you may be used to visiting wineries from Michigan and its surrounding states, take note that Napa wineries and tastings are much more expensive than in the Midwest. A tasting at a winery in Napa will cost you double to triple more than the Midwest. We spent the day driving around Napa and checking out the views before boarding the train in the evening. We learned later learned that the train covered all the sightseeing we had done via the car, so if taking the train you can save yourself some time and view from aboard! The Gourmet Express Dinner train was a 3-hour train ride through Napa Valley in the evening accompanied by a 3-course gourmet meal. This train typically runs around $160+ per person and you will want to book in advance, especially during the busy seasons. We visited Castello di Amorosa on a Sunday afternoon, after making reservations in advance for their Premium Guided Tour. I highly suggest this tour over the general admission because it will give you access to additional parts of the castle, better views, and a tour guide. It’s worth the $45 per person and includes a tasting. While my husband had been to San Francisco before, it was my first time visiting California and I had my heart set on seeing the Golden Gate Bridge and catching a glimpse of some sea lions! The highlights of our time in San Fran included visiting Pier 39, watching sourdough be made in front of Boudin’s Bakery, the Fishermans Wharf, eating sushi and drinking bubble tea, catching a glimpse of the Full House house, Bakers Beach, and the Golden Gate Bridge. This is my travel tip for San Francisco: Go into San Fran first, explore the city and Pier 39 and THEN drive across the Golden Gate Bridge from the south side. (If you drive in from the south side you will not have to pay any tolls to cross the bridge. There is a toll from the north side and it is much busier!) From there you can jump on Highway 1 and go north along the Pacific Coast. I had received several suggestions to go to Bakers Beach for views of the bridge. On this particular day, it was super foggy and we weren’t able to see the entire bridge in full view but Bakers also offered us the opportunity to walk the coast and be away from all the crowds and tourist. Towards the end of our trip, we took a drive along The Pacific Coast Highway (Hwy 1) from San Francisco to Point Reyes National Seashore. This is a breathtaking drive, but heed to this warning: it’s not for the faint of heart. So, I’m a tad bit afraid of heights and was expecting this drive to be just a highway along the seashore. It’s more like a small, 2-lane road that winds around the side of a mountain/cliff, literally right over the ocean. Let me tell ya, if you want to test your marriage out give this little adventure a go (haha)! There was a lot of construction going on and at the time I didn’t realize that there was a landslide six months prior and they had just reopened the highway. The views were worth it and the drive is likely not a problem for most people who don’t have a fear or heights…or falling of cliffs. Our stops along the way included Mt. Tamalpais State Park, Muir Beach Overlook, and Stinson Beach. Mt. Tamalpais State Park offers amazing views of northern California if you make the 2,571-foot peak to the top. There is no entrance fee and you’ll want to arrive early to avoid the mountain fog and driving in this area at night. Before or after your time at the park, I recommend stopping at the Mountian Home Inn to grab a bit to eat (food serve stops early, so check times in advance). Not only is it the only restaurant within miles, but they have outdoor seating with views that you won’t find anywhere else! If you can afford the luxury, they have lodging available as well. Muir Beach Outlook was the highlight of our entire day! After parking, take a very short hike to the outlook for incredible views of the most amazing outlook over the Pacific Ocean. It was hard to find due to GPS being spotty and directs you to the wrong place (there is even a sign at that location that notes GPS is wrong) but if you keep focused on the signs you’ll eventually find it. Again, if you have a fear of heights you’ll want to be aware that the trail to the outlook could cause a bit of anxiety. I didn’t have too many problems with this myself but it’s worth noting. Well, that’s a wrap. Northern California was amazing. Unforgettable honeymoon. Also, visit In-N-Out Burger. Just do it, everyone will suggest this! I can no longer look at Five Guys the same way but it was the best 11 pm dinner decision ever.